This spacious first floor condo is located in the popular community of Palm Suites, as featured on HGTV Househunters Intl. The condo features a living room, dining area, fully stocked kitchen with breakfast bar, laundry room, full bathroom, master bedroom with walk in closet & ensuite, large balcony as well as grassy backyard area. When you arrive, you can expect all the comforts of home including central air, hot/cold water dispenser, ceiling fans and screened windows to enjoy the fresh air. The kitchen is equipped with full size fridge, stove, and oven, as well as microwave, toaster, coffee maker, blender, and all utensils/cookware/dishes you require. All towels, beach towels & bed linens are provided as well. For your entertainment there is cable TV, DVD player with USB input, and wifi. The community boasts a large inviting pool, free parking, and 24/7 security. 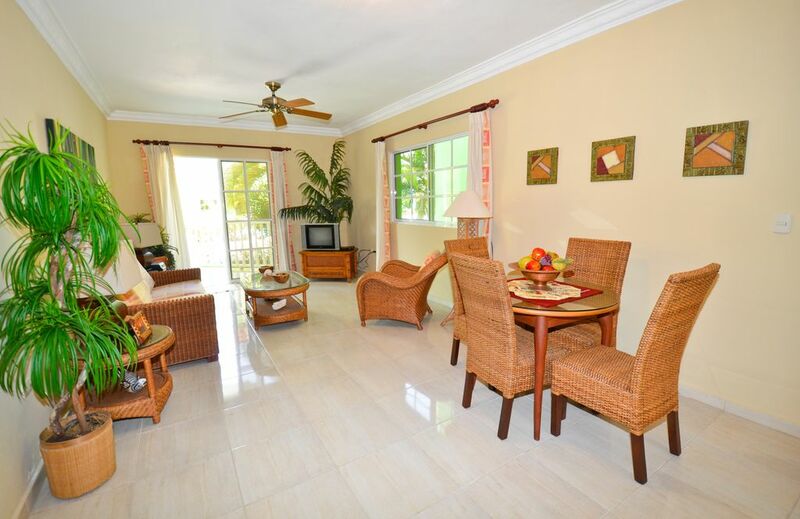 It is an easy 5-10 minute walk to the white sandy Bavaro beaches. PERFECT LOCATION! Palm Suites is located with a 5-10 minute walk of several shopping plazas with grocery stores, restaurants, sports bar, bakery, money exchange, and shops. Other nearby amenities include more dining options, spas, casino, ATM, car rentals, and much more. The Palma Real Mall is a short 5 minute drive and includes the Hard Rock Café, Outback Steakhouse, high end international brand name shops, supermarket, nightclub, and a movie theater. The San Juan Mall is a 10 minute drive and is home to a large supermarket, Pizza Hut, IKEA, IMAX theater, and more. A $1 public bus is available right around the corner from the condo. For the sports-minded guests, there are 9 championship golf courses within a 5-45 minute drive of the condo. Excursions available in the area include buggy tours, horseback riding, ziplining, parasailing, fishing, boat tours, and more. Onsite assistance & services available: Our condo is professionally managed by a reputable onsite Property Management Company with services available in English, Spanish, German and French. Discounted excursion (tour) options and transportation services are provided to vacation rental guests. The office is just a short walk around the corner from our condo, with friendly staff available in person daily and able to assist with any questions or concerns you may have, before, during and after your stay. The walls show water damage in each room. They need repair. The mechanicals all worked fine ( air conditioning, fans, refrigerator, etc.) The main room furniture is college-quality. The unit had not been cleaned after the last occupants vacated several days prior, so when we were asked to meet the agent at 9 am for check-in, the unit was unclean and smelly. (mistake noted) By our next 4:00 pm check-in,the unit was cleaned and the odors were largely but not completely gone. We would not rent this unit again under the same condition. Get off the resorts and explore the real Punta Cana! This condo enables you to do just that as it is minutes away from the real life of this beautiful island: beaches, shopping, restaurants, and night life. The condo gives you everything you need--fully loaded kitchen, well-maintained pool, wifi, washer/dryer--all tucked away in a quiet, secure community. I will be back! All of us here at Reliable Realty are very happy to hear you enjoyed the condo and your vacation and we welcome you back anytime! We are all very happy to hear you had a nice and enjoyable enjoyable vacation and welcome you back anytime! We stayed here a few weeks ago and had a wonderful time! It really is walking distance to everything which is convenient because we don't like to drive. The condo and the area were very clean. everything we needed was there. Pool was a bit dark from all the rain but still warm. We booked fishing and zip line excursions through the property manager and everything went great. ALready thinking of booking for next year! We stayed for a week and had a great time. Condo was as advertised, clean and spacious. It is very close to the pool which was handy for getting drinks or bathroom breaks! The pool was very clean and the water was warm, everyone we met around the pool was so friendly! The bedroom has tons of closet space. The kitchen was big and had everything we needed. It was only a short walk to the beach (5 min). Had lunch at the Beach Grill, very good food (tip: customers can use the beach chairs). We also ate at several local restaurants for dinner and they were all good. Everything is close: a 3 min walk around the corner to the property managers office (to book tours) and a nice restaurant right below their office. There is a plaza about 7-8 min walk with a grocery store and several restaurants, we ate at Citrus a couple of times. Another tip: use the money exchange in El Dorado plaza for best rates. We paid extra when booking for the airport pickup and it was totally worth it - the driver was waiting for us with a sign and we didn't have to worry about trying to find a taxi driver that spoke English!! We were met at the condo by Gregory from the property management company, and he was very helpful and showed us everything we needed to know. Thanks for a great stay! We will definitely go back and would definitely recommend this condo to anyone! El apartamento es muy cómodo,muy completo,no necesite nada que no hubiera en el.Lo único que podría sugerir es cambiar los colchones,tanto de la habitación principar como del sofá cama del living y arreglar el soporte de la ducha en el baño pequeño.El resto estuvo perfecto!! !.La conexion wifi es muy buena. El condominio es muy tranquilo ,ideal para descansar, y disfrutar del aire libre,tanto de día como de noche.Hay personal de seguridad permanente ,el cual siempre fue muy atento.El sr Gregory,quien nos recibió,es muy amable ,nos permitió dejar el equipaje hasta que estuviera listo el apartamento,mientras disfrutamos la mañana en la playa.La atención del Sr Tood,muy profesional,siempre bien predispuesto a las consultas y con respuesta inmediata. Siempre muy bien comunicados .Nos facilito la posibilidad de quedarnos 2 días mas de lo previsto sin ningún inconveniente. Realmente es un lugar y gente para recomendar.El lugar esta muy cerca de la playa,en una zona muy tranquila y segura. Sin dudas volvería !!! El Cortecito & Los Corales are directly next to each other. They are both considered the safe & friendly tourist / expat towns of Punta Cana. This is the area where several beach accesses, shopping, groceries, numerous dining options and activities are located all within a safe 4-15 minute walk. Please Note: If you are flying into Santo Domingo, it is a 2 hour drive to Punta Cana & Punta Cana does not have any official addresses. It is recommended to fly directly into Punta Cana Intl. Airport & prearrange with us transportation with an English speaking driver who knows the area well. Most Taxi drivers only know where the resorts are & not the names of condo communities or Plazas. Other Activities: Zip-lining, parasailing, catamaran tours, buggies, Island tours, cultural tours, etc.